My students would tell you that I say this about every lesson, but I really think that teaching students how to write linear equations is my favorite unit. There’s ample opportunity for exploration and discovery, applications, and extensions! 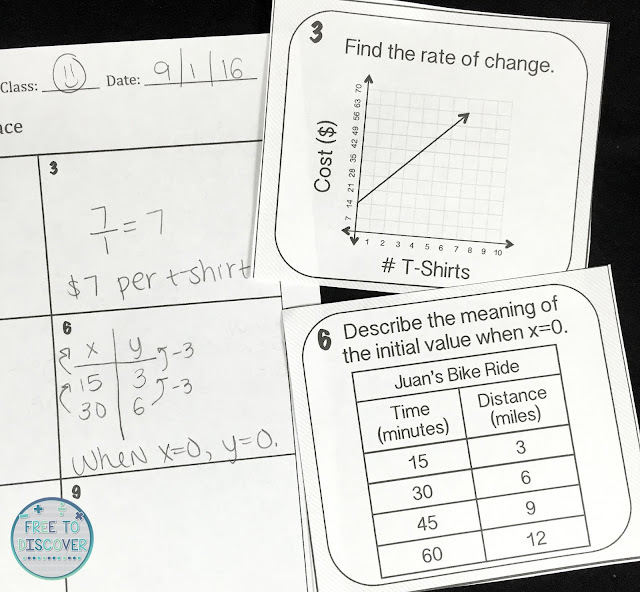 The unit that precedes writing equations is typically centered on slope and rate of change. 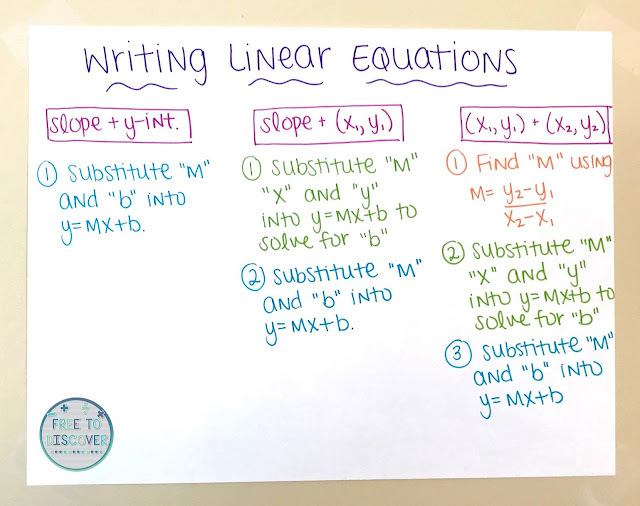 I get so excited when we start looking at equations and graphs in terms of slope that I usually start pointing out patterns or leading students to make connections and draw inferences about the y-intercept themselves. At this point, we typically spend a little time looking at arithmetic sequences. 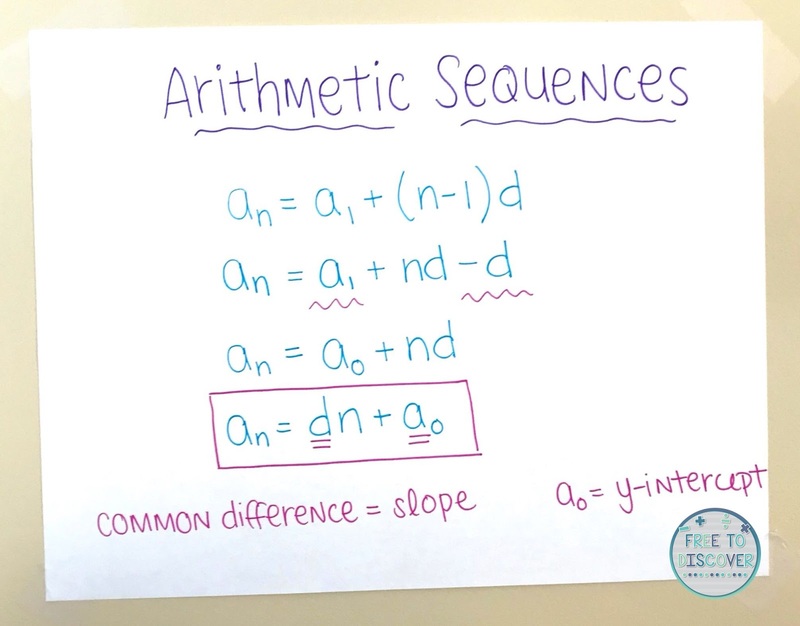 We use the arithmetic sequence formula, and then discover patterns to formulate our own formula (which – ahem – is basically slope-intercept form). 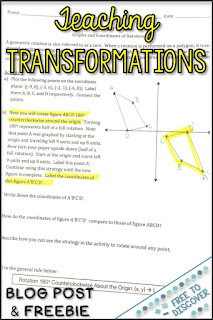 CCSS 8.EE.B.6 mandates that we “use similar triangles to explain why the slope m is the same between any two distinct points… [and] derive the equation y=mx for a line through the origin and the equation y=mx+b for a line intercepting the vertical axis at b.” I’ve created a discovery worksheet that facilitates the exploration of these big ideas. You can scoop it up here. Organized notes and repetitive reminders of the steps are super important here. I will typically create an anchor chart that outlines the steps given each potential set of information. Notice all of the exact language that I use (also great for your ELLs). 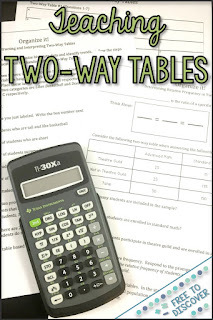 Demonstrate a variety of examples and allow students ample time to practice their new skills. 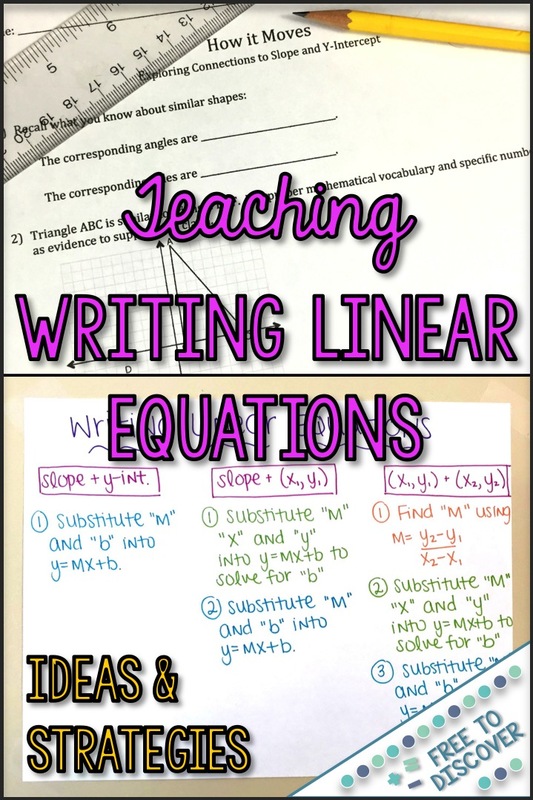 I teach in a 55-60 minute class period, and I spend two days on each topic: writing equations given a graph (or slope and y-intercept), writing equations given the slope and a point, writing equations given two points. The first day we take notes and begin to practice the new skill. Then we continue hands-on practice on the second day. 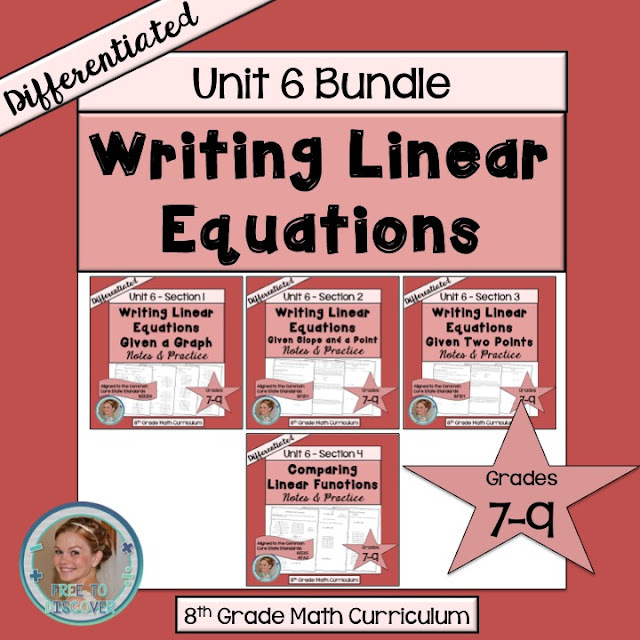 Check out my differentiated notes and practice here. Opportunities for differentiation here! I’m not talking about textbook word problems here… snore. Cow population, birth defects, what?? There are so many examples of linear relationships in our students’ lives. Use examples about social media, sports, music, etc. 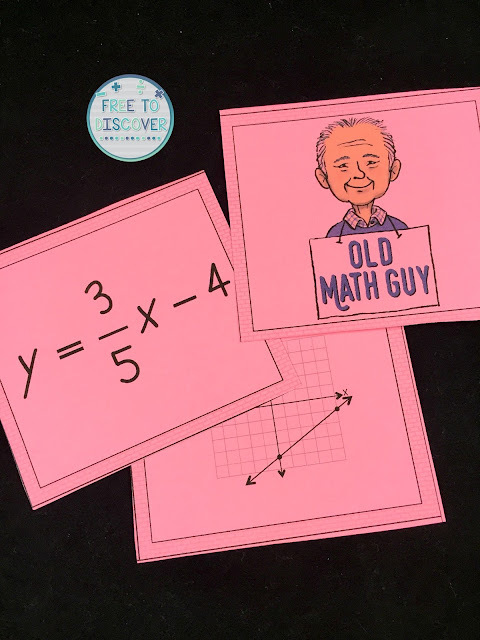 I have a set of rate of change and initial value task cards that uses real examples. 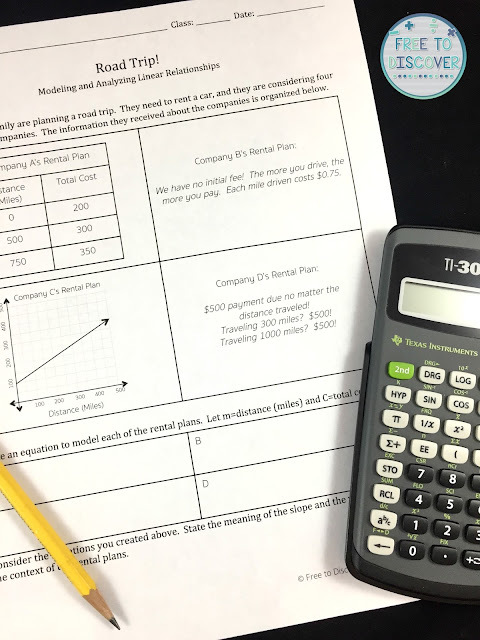 Students also love the analysis and discussion required for this discovery worksheet about planning a road trip. Ask students to draw inferences, make predictions using their equation, discuss limitations, and – most importantly – allow time for debate. You will turn those adolescent brains right on when they get to argue, and your colleagues in the humanities will thank you for practicing supporting arguments with evidence. ~ NOTE ~ Depending on your comfort level with thinking on the fly this lesson could potentially have ZERO prep. 1) Everyone sits at their desk with a piece of notebook paper and a pencil. 3) Announce a slope and a point (for example). Everyone at their desk writes down the information on their paper at the same time that the volunteers on the front board use the whiteboard markers. Everyone in the class writes the equation given that information. I focus on the students at the front and provide subtle redirection as needed, scan the class to make sure everyone is working, and provide assistance to a student or two at their seats if needed. 4) We discuss things that are great or potential pitfalls to watch for then repeat with a new group at the front board. 5) Everyone loves it! And seriously… I very rarely prep for this lesson. And of course I’d be remiss if I didn’t mention that I have a super popular OMG game for this topic. Haven’t played yet? So many opportunities for extension here! 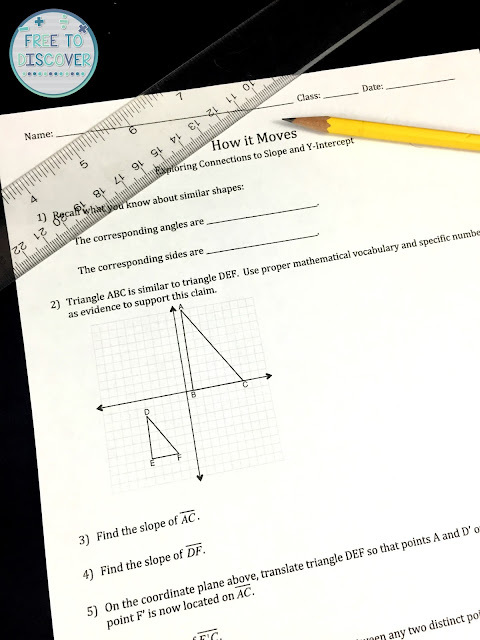 You could introduce relationships with parallel or perpendicular lines, scatter plots (and really collect data), standard form of linear equations, graphing calculator extensions and more! Write the equation of the line perpendicular to 2x-y=8 that shares the same x-intercept as the given line. Join in the conversation! 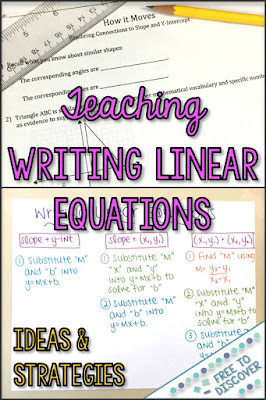 What are your favorite ways to teach students how to write linear equations?